When I first watched the pilot episode of The Flash, I had about the response I was expecting to have. There were a lot of cringe-worthy moments and I found it to be unintentionally hilarious. The characters, the story, everything was so predictable. 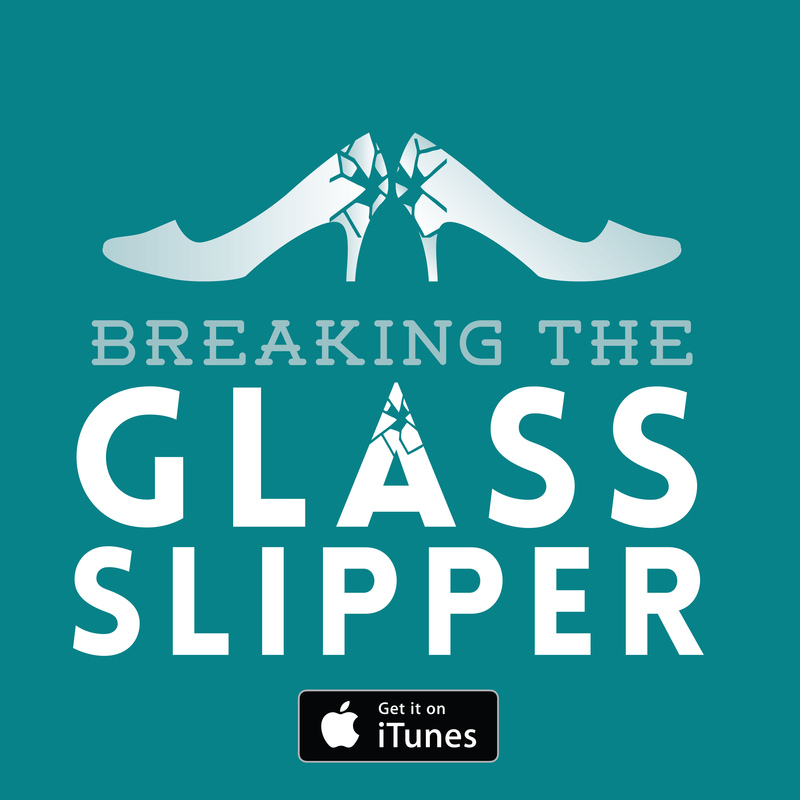 And yet, I tuned in for episode 2, 3, 4… I couldn’t stop. The show made me smile. Soon, the writing team realised that part of the show’s spark was that, unlike its companion series, The Flash worked best when it did not take itself too seriously. Tongue in cheek, self-aware, with added camp, this is the fun and silly superhero series we’ve needed for a long time. 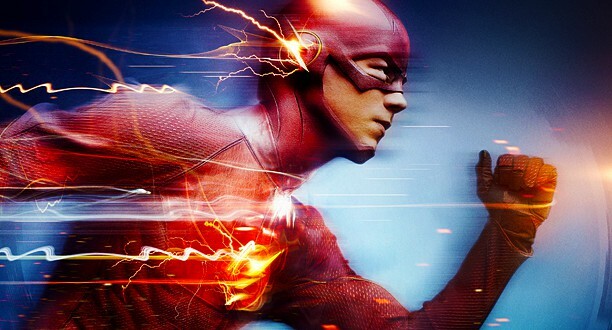 The show’s opening expository sequence, played before each episode, highlights Barry Allen’s (aka The Flash’s) biggest strength as a character and his biggest weakness as a character to write compelling storylines for: ‘My name is Barry Allen and I’m the fastest man alive.’ How do you create tension in a story about a man who can literally out-run everyone? How could anything really be a threat to him? Surely he can take out any threat before they even see him coming, right? Then you have all the extra cascade effects of his super speed to do with vibrations – he can create a sonic boom, whip the air to stop a tidal wave, and even create a vacuum to pull all the air out of a closed area to dampen the flames of a roaring fire. Honestly, what can this guy not do?! With a character like the Flash, how do you keep creating tension? Especially when he has a great tech/medical team behind him to help him every step of the way as well? Surprisingly, the show manages to keep raising the stakes – and it only feels forced and overly convenient some of the time. I was worried that with each new villain we’d be given a more outrageous and unbelievable superpower that could somehow circumnavigate the Flash’s abilities (or rob him of them for the course of an episode) – and, to an extent, I was right. However, sometimes there are simple ways around Barry’s speed. He’s just a man; he can’t know where or when things will happen. If the villains are quiet enough, or hide someone well enough, how will Barry’s speed help? There’s a fun message in Buffy about how she is the first slayer to really have a close group of friends grounding her to the world – and perhaps, this is the very thing that keeps her alive well beyond the ordinary use by date of a slayer. This is something that also clicks with The Flash. Barry isn’t aloof, he doesn’t pull away from his friends. Instead, he relies on them every step of the way. So while the show might ostensibly be about this speedster meta-human, it is also about relationships, great friendships, and family (not just blood family either, but the families we make for ourselves). 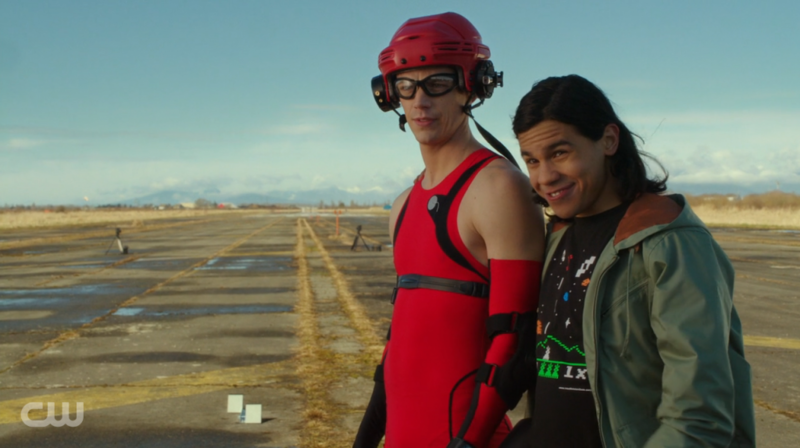 The Flash — “Plastique” — Pictured (L-R): Grant Gustin as Barry Allen, Carlos Valdes as Cisco Ramon, and Candice Patton as Iris West — Photo: Jack Rowand/The CW — © 2014 The CW Network, LLC. All rights reserved. While the cast is rounded out by broad-brush stroke characters to begin with, they become ever more endearing and fleshed-out as the show progresses. The heroes do, anyway. Harrison Wells and his alter ego, not so much. He is very much the moustache-twirling villain you would expect – but that has a campy silliness to it that is also rather endearing. 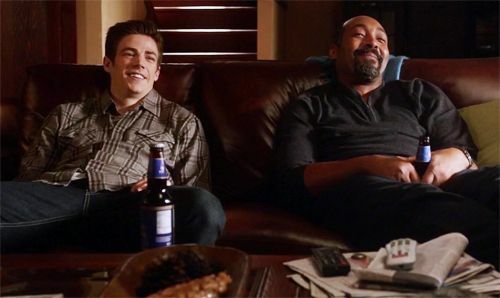 My favourite relationship of the series is easily Barry and his adoptive father Joe. It’s one of those classic father son pieces where they are both friend and family, each feeling a tremendous responsibility for the other, and trust one another completely. 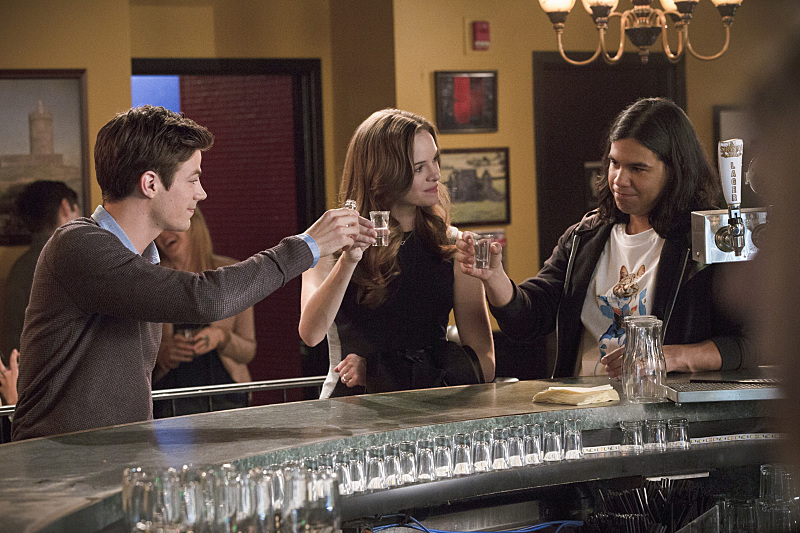 The friendship that develops between whizz kids Caitlin, Cisco, and Barry is another piece that brings incredible heart to the show. So many superhero origins have the personal tragedy element. It is well and truly getting old. Somehow, I don’t mind it so much in The Flash. I like how his past, present, and future all tie into one another and that he has already failed to save his mother. While Barry’s life is tinged with tragedy – his mother was killed by something ‘impossible’ when he was 11 and his father went to prison for her murder – but things could have been a lot worse. He was taken in by detective Joe West and had a wonderful life with him and his daughter Iris. He’s grown up to be well adjusted and educated; he has great friends and a career. Really, Barry hasn’t exactly done badly for himself. Another piece that sets Barry apart from many of his superhero peers is that while tragedy is part of his past, what drives him is mostly hope. Sure, there’s plenty of vengeful feelings mixed in there, but his biggest goal is to clear his father’s name. And at each turn, he finds that plan thwarted. But isn’t that refreshing: to have a hero driven by hope? It certainly makes for nice change amongst the dark, brooding, pessimistic worlds of most of the other superheroes we see on screen. While The Flash might not be the most original or well written, it is an absolute blast to watch. Fun TV to enjoy at the end of a long day is just what the doctor ordered. And now we can all rest easy, as it’s been picked up for a second season already. Next: Epic, heroic, urban… What’s the difference between fantasy sub-genres?